Our goods are made to last, and we’re here to help you give them the best life possible. All of our leathers are tough, so be relatively kind and it will do the job. To go all out, keep it clean and apply protector approximately every 6 months. Here are some of our suggestions how to protect and treat our leather. This a split leather that has been lightly oiled, and is made to be roughed up. Distress creates its character, and this builds over time. This leather thrives on neglect. There’s no need to do anything. Lightly press with a damp cloth and let dry away from harsh heat or light. Buff with a soft, dry cloth. For extreme cases, take into a shoe repair shop. To maintain lasting quality, you can apply a quality leather conditioner/rejuvenator to your goods, 1-2 times a year. First rub in the product, then buff with a soft, dry cloth. This will protect the leather and keep it looking beautiful. Suede is the most soft and supple of our leathers, having been thoroughly sanded on both sides and taken from the inner side of the hide. This leather is the most delicate. Protect your suede with a suede protector spray. Spray thoroughly (after testing a small section for staining), then let dry for 24 hours. After, buff lightly with dry cloth or suede brush to re-nap the suede. Apply suede protector approximately every 6 months. Use a protector spray in advance to prevent staining (after testing a small section). To do so, thoroughly spray your goods with a nubuck protector suede, then let sit for 24 hours. After, buff with soft, dry cloth. Gently brush dirty area with a nubuck cleaner brush. For heavy dirt or stains, remove with a nubuck eraser, and buff with a suede or nubuck brush. 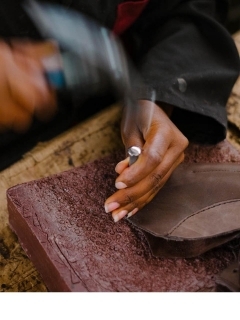 For any heavy staining or concerns, take to your local shoe repair shop. Our shoes are not waterproof. It is highly recommended to avoid wearing them in the rain, snow or other wet conditions. 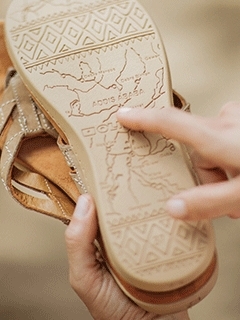 Some are made with a stitch-down construction technique, which means there are tiny holes around the base of the sole. In addition, natural leather is susceptible to stains caused by de-icing salt and cleaning chemicals used to clean the city streets when mixed with water, rain or snow. This remains true even if the shoes have been treated with a wax or spray. We recommend applying our Gorilla Wax to help protect and preserve the leather. Our Gorilla Wax is an all-natural waterproofing wax, made in Canada using organic ingredients such as Beeswax, Bee Propolis, Sunflower Oil and Shea Butter. Wax is to be applied only on leather. Not recommended for suede. Wax may darken leather. We recommend spot-testing on product first. We've done a great deal of research on the positive and negative effects of various disposal methods including upcycling, incineration, biogas and others. We believe the most responsible way to dispose of our shoes is to take out the usable parts, like laces and insoles, donate or use those parts and discard your shoes at a local garbage facility. The natural leather and rubber in our products will eventually decompose. We are committed to continuing our research, to ensure the methods used emit the least amount of physical waste, CO2 and other undesirable effects. If you'd like more information on our methods or would like to offer insight of your own, please email us at info@oliberte.com and we'd be happy to discuss.